The NCM has announced registration for the National Corvette Museum’s 25th Anniversary Celebration/6th National Corvette Caravan will open on Wednesday, September 12, 2018. (08:00 AM CST). Registration is $30.00 for Lifetime Members; $40.00 for Members; and $65.00 for Non-Members. Those who pre-register will receive a commemorative event program, lapel pin, dash plaque, lanyard, and personalized hard card event credential. A reminder, you need to register yourself AND your spouse for the 2019 Anniversary Event AND Caravan tickets. Additionally, make sure you select the Florida State Caravan option. This allows the museum to know what Caravan Captain to mail the window stickers as well as providing another level of confirmation of your paid registration. The reopening of the GM Assembly Plant and the continuance of the plant tours remains uncertain. The Plant has stated they will let us know six months prior to when tours can be opened. The NCM Motorsports Park will offer a number of activities including touring laps in your own car and hot lap rides. There are no guided road tours planned. When you register in advance for the event, you will have the option to specify which caravan (Florida) you will be participating. Your registration materials/credentials will be sent to the Florida Caravan Captain (Sue MILITELLO) and provided to you prior to your arrival in Bowling Green, KY. This will allow you to skip the lines and join in on the fun immediately upon arrival. Again, if not an NCM member, it behooves members planning to attend the Caravan/Anniversary festivities to obtain a NCM membership. Memberships are a tax-deductible $50.00/year for an individual and includes discounts on event registration, Corvette Store discounts, America’s Sports Car magazine subscription, Supplier Pricing on select General Motors vehicles and more. If you become a new member, remember to advise our Ambassador, Ron TANNER, at e-mail bandito2108@hotmail.com. Also, recommend you visit the local Florida Caravan web site at http://www.nationalcorvettecaravan.com/fl. It is here you will find the most recent info for the ”Florida Caravan.” On this local site, you can glean the latest information and, if desired, how to order the Florida caravan shirt, flag, and rear window static cling. Once you have obtained/confirmed your Anniversary/Caravan registration, it is requested you advise me (mikewhite410@gmail.com). I am maintaining a record to assure everyone has accomplished the requisite details and, as best I can, limit the potential problems that will inevitably occur. If you need any assistance, my e-mail is mikewhite410@gmail.com – my home phone contact is (352) 751-2502. Often referred to as the world’s largest moving automotive event, the National Corvette Caravan is a celebration of America’s Sports Car, culminating in Bowling Green, Kentucky for the anniversary celebration of the National Corvette Museum. 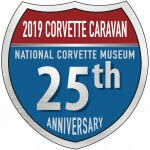 Regional caravans will form and join other caravans as they travel across the United States to meet in Bowling Green, Kentucky for four days of festivities at the National Corvette Museum. An event such as this requires years of planning and coordinating. The Museum is located at I-65, exit 28 in South Central Kentucky and is open daily, 8am to 5pm Central Time. Below is a list of lodging options in Bowling Green and the surrounding communities. Keep in mind many hotels cannot book until 1 year out. Some hotels have established a wait list. Notes are included with many hotels to aid in your booking. Keep in mind hotel rooms will open up 1 month prior to the event, and even in the days leading up to the event. If Bowling Green hotel rooms sell out, consider booking outside of Bowling Green with the option to move hotels closer to time if something becomes available. We will continue to update this site as new information is available. 2 Rooms, 1 Suite, Private Baths, National Register of Historic Places, Covered Parking, 55 Acres, Outdoor Pool, Free WiFi. Restaurant, Outdoor Pool, Refrigerator / Microwave in all rooms, Free WiFi, Accepts Small Pets, Continental Breakfast, Business Center, Exterior Corridors. 500 Campsites, Accepts Pets, Meeting Rooms, Full Hookups, Pull Thrus, WiFi available for a fee, Some 50 Amp Service, Shady Sites, Surrounded by Barren River, Adjacent to Amusement Park and Raceway. Suites, In-Room Jacuzzi, Refrigerator / Microwave in all rooms, Free WiFi, Accepts Pets, Continental Breakfast, Interior Corridors. Reservations will be accepted one year prior to the event. Refrigerator / Microwave in all rooms, Exterior Corridors. Suites, In-Room Jacuzzis, Indoor Pool, Refrigerator / Microwave in all rooms, Free WiFi, Full Breakfast, Interior Corridors. Suites, Refrigerator / Microwave in all rooms, Free WiFi, Interior Corridors. Refrigerator / Microwave in some rooms, Free WiFi, Exterior Corridors. In-Room Jacuzzis, Indoor Pool, Refrigerator / Microwave in all rooms, Free WiFi, Accepts Pets, Continental Breakfast, Meeting Room, Interior Corridors. Individual Reservations will be accepted 6 months prior to the event. Outdoor pool, Refrigerator / Microwave in all rooms, Fitness Center, Free Wi-Fi, Accepts Small Pets, Complimentary Breakfast, Business Center, Interior Corridors. 10 Cabins – 1 and 2 Rooms, A/C and Heat, TVs. 4 Lodges – Sleeps 6, AC and Heat, Bathrooms, Kitchenettes, TVs. Outdoor Pool, Accepts Pets, 120 Campsites, Propane, Full Hookups, 50 Amp Service, Free WiFi, Shady Sites, Fishing, Cable, Mini Golf, Meeting Lodge, Mini Boats. Suites, Indoor Pool, Refrigerator/Microwave in all rooms, Fitness Center, Free Wi-Fi, Accepts Pets, Meeting Room, Business Center, Interior Corridors. 2 Master Studios, 2 Town-homes with 2 Bedrooms Each, Internet Access, On-Site Restaurant, Lounge, Outdoor Pool, Tennis, Golf, Meeting Space at the Club at Olde Stone. Suites, In-Room Jacuzzis, Indoor Pool, Refrigerator / Microwave in all rooms, Fitness Center, Free Wi-Fi, Accepts Small Pets, Free Breakfast, Meeting Room, Business Center, Interior Corridors. No availability, no wait list. Restaurant, Lounge, Suites, In-Room Jaccuzzi, Indoor Pool, Refrigerator / Microwave in some rooms, Fitness Center, Free WiFi, Business Center, Interior Corridors. Reservations will be available 52 weeks prior to the event. Suites, In-Room Jacuzzis, Outdoor Pool, Refrigerator / Microwave in some rooms, Free WiFi, Accepts Small Pets, Free Continental Breakfast, Interior Corridors. Reservations will accepted one year prior to the event. Suites, Indoor Pool, Refrigerator / Microwave in all rooms, Fitness Center, Free WiFi, Accepts Pets, Full Breakfast Included, Meeting Room, Business Center, Interior Corridors. Reservations will be accepted a year prior to the event. In-Room Jacuzzis, Outdoor Pool, Refrigerator / Microwave in all rooms, Free WiFi, Accepts Pets, Free Continental Breakfast, Exterior Corridors. Group and Individual Reservations will be available 2 years prior to the event. In-Room Jacuzzis, Outdoor Pool, Refrigerator / Microwave in all rooms, Free WiFi, Accepts Pets, Free Continental Breakfast, Exterior Corridors. Suites, Indoor Pool, Refrigerator / Microwave in all rooms, Fitness Center, Free WiFi, Free Continental Breakfast, Meeting Room, Business Center, Interior Corridors. All rooms currently blocked by individual caravans. No wait list available. Outdoor Pool, Refrigerator / Microwave in some rooms, Fitness Center, Free WiFi, Accepts Small Pets, Complimentary Continental Breakfast, Meeting Room, Business Center, Interior Corridors. All rooms currently blocked by an individual caravan. Restaurant, Lounge, Suites, In-Room Jacuzzi, Indoor Pool, Refrigerator / Microwave in all rooms, Fitness Center, Free WiFi, Meeting Rooms, Business Center, Interior Corridors. Outdoor Pool, Refrigerator / Microwave in all rooms, Fitness Center, Free WiFi, Accepts Pets, Complimentary Full Breakfast, Meeting Room, Business Center, Interior Corridors. Individual reservations will be accepted one year prior to the event. Group blocks not available. Waiting list will be available. Restaurant, Lounge, Suites, Indoor Pool, Refrigerator / Microwave, Fitness Center, Free WiFi, Accepts Small Pets, Meeting Rooms, Business Center, Interior Corridors. All group blocks are spoken for. Any rooms available outside of the block for individual reservations will open up 50 weeks prior to arrival. Not currently taking any waitlist. Suites, Refrigerator / Microwave in all rooms, Fitness Center, Free WiFi, Accepts Pets, Interior Corridors. Waitlist Available. Suites, In-Room Jacuzzi, Indoor and Outdoor Pools, Refrigerators / Microwaves in all rooms, Free WiFi, Complimentary Continental Breakfast, Meeting Room, Business Center, Interior Corridors. Suites, In-Room Jacuzzis, Indoor Pool, Refrigerator / Microwave in all rooms, Fitness Center, Free WiFi, Accepts Pets, Complimentary Continental Breakfast, Meeting Room, Business Center, Interior Corridors. Refrigerator/ Microwave in all rooms, Free WiFi, Complimentary Continental Breakfast, Interior Corridors,Fitness Center, Free WiFi, Accepts Pets, Complimentary Continental Currently Accepting both Group and Individual Reservations. Outdoor Pool, Refrigerator / Microwave in some rooms, Free WiFi, Accepts Pets, Exterior Corridors. Lounge, Outdoor Pool, Refrigerator / Microwave in all rooms, Free Wi-Fi, Free Breakfast, Exterior Corridors. Restaurant, Lounge, Suites, In-Room Jacuzzis, Outdoor Pool, Refrigerator / Microwave in all rooms, Fitness Center, Free WiFi, Accepts Small Pets, Continental Breakfast, Meeting Rooms, Business Center, Interior Corridors. Reservations will be accepted 6 months prior to the event. In-Room Jacuzzis, Refrigerator / Microwave in all rooms, Free WiFi, Accepts Pets, Continental Breakfast, Exterior Corridors. Suites, In-Room Jacuzzis, Indoor Pool, Refrigerator / Microwave in all rooms, Fitness Center, Free WiFi, Accepts Pets, Full Breakfast, Meeting Room, Business Center, Interior Corridors. Currently Accepting both Group and Individual Reservations. 6 Rooms, 2 with Private Baths, In/Outdoor Sitting Areas, Secure Indoor Parking, WiFi. Outdoor Pool, Refrigerator / Microwave in all rooms, Fitness Center, Free WiFi, Accepts Pets, Continental Breakfast, Business Center, Interior Corridors. Indoor and Outdoor Pools, Refrigerator / Microwave in all rooms, Free WiFi, Accepts Pets, Continental Breakfast, Meeting Room, Business Center, Interior Corridors. Group and Individual Reservations will be accepted one year prior to the event. Suites, Indoor Pool, Refrigerator / Microwave in all rooms, Fitness Center, Free WiFi, Accepts Small Pets, Continental Breakfast, Meeting Room, Business Center, Interior Corridors. All rooms currently blocked by individual caravans. Refrigerator / Microwave in all rooms, Free WiFi, Accepts Small Pets, Exterior Corridors. Refrigerator / Microwave in all rooms, Free WiFi, Exterior Corridors. Restaurant, Lounge, Suites, Outdoor Pool, Refrigerator / Microwave in some rooms, Fitness Center, Free WiFi, Accepts Small Pets, Full Breakfast, Meeting Rooms, Business Center, Interior Corridors. Currently Accepting Group Blocks. Individual Reservations will be accepted one year prior to the event. Suites, Outdoor Pool, Refrigerator / Microwave in all rooms, Fitness Center, Free WiFi, Accepts Pets, Full Breakfast, Meeting Room, Business Center, Interior Corridors. Outdoor Pool, Refrigerator / Microwave in some rooms, Free WiFi, Small Pets Accepted, Exterior Corridors. 4 Rooms, Wrap-Around Porch, Meeting Room, Near Antiques. Free Hot Breakfast. Business Center, Fitness Center, Indoor Heated Pool, DSL and Wireless Internet, Guest Laundry, Pet Friendly (Fees Apply), Microwaves, Refrigerators, Flat Screen Televisions, Meeting Room. Some Handicapped/Wheel Chair Rooms, Continental Breakfast, Cable Tv, Fax Service, Some Rooms With Microwave and Refrigerator, Outdoor pool, Wireless High-Speed Internet, Pets Allowed, RV/ Truck Parking. Handicapped/ Wheel Chair Rooms, Continental Breakfast, Seasonal Outdoor, Pool, Coffeemaker, Microwave/ Refrigerator, Small Pets Allowed (Fees Apply), Free Local Calls, Coach, Truck/ RV Parking. Handicap accessible, Hot or On-The-Go Breakfast in a Bag, Meeting Room for Small Group, Fitness Center, Outdoor Pool, Wireless High-speed Internet, Coin Laundry, Business Center. Reservations will be accepted one year prior to the event. All group blocks must be called in at least 4 months prior to the event. Business Center,Wireless Internet Connections, Meeting Room, Laundry and Valet Services, Breakfast, Heated Indoor Pool, Hot Tub, Jetted- Suites, Small Pets (Fees Apply). Both Group and individual Reservations will be accepted one year prior to the event. Large Vehicle Parking, Continental Breakfast, Handicapped Accessible, Pets Allowed (Fees Apply), Refrigerator, Coffee Maker in All Rooms, Cable TV, Wireless High-Speed Internet. Handicap Rooms, Free Full Breakfast, Microwave, Refrigerator, Wireless High-Speed Internet Access, Cable TV, Small Pets Allowed (Fees Apply), Business Center, Coach Parking. Handicapped Accessible, Free Breakfast, Cable TV, High-Speed Internet, Business Center, Pets Allowed (Fees Apply), Microwaves in Rooms, Truck/RV Parking, Seasonal Outdoor Pool, Guest Laundry. Business Center, Free Standard Internet Service, Fitness Center, Indoor Pool, On-Site Guest Laundry, Buffet Continental Breakfast Included. Indoor Pool, Business Center, Meeting Room, Laundry Service, Free WiFi, Valet Services, Laundry Services, Indoor Pool, Pets Allowed. Reservations will be accepted one year prior to the event. Free Breakfast, Dry Cleaning Services Available, Meeting Rooms, Laundry Service, Concierge, Self Service Laundry. Business Center, Free Standard Internet Service, Fitness Center, Indoor Pool, On-Site Guest Laundry, Buffet Continental Breakfast Included. Reservations will be accepted one year prior to the event. Microwaves, Refrigerators, Business Center, Free High-Speed Wireless Internet, Continental Breakfast, Guest Laundry, Seasonal Outdoor Pool. Full Breakfast, Cable TV. Wireless Internet, Wrap-Around Porch With Outdoor Seating. Outdoor Pool, Business Center, Free WiFi, Free Breakfast, Microwaves, Mini-Refrigerators, Pets Allowed (Fees Apply). Guest Laundry, Exercise Room, Indoor Heated Pool, Free Hot Breakfast, Free Newspaper Monday-Friday. Reservations will be accepted one year prior to the event. Outdoor Pool, Meeting Room, Free Continental Breakfast, Free High-Speed WiFi, Business Center. Reservations will be accepted one year prior to the event. Business Center, Free Continental Breakfast, Mini-Refrigerator in Select Rooms, Microwave in Select Rooms, Swimming Pool, Free WiFi, Pets Allowed. Business Center, Pool and Hot Tub, Free Breakfast, Free High-Speed WiFi, Mini-Refrigerator, Microwave. Reservations will be accepted one year prior to the event. Business Center, Meeting Rooms, Fitness Rooms, Accessible Rooms, Pool, Complimentary Breakfast, Free High-Speed Internet. Reservations will be accepted one year prior to the event. Free Full Breakfast, Seasonal Outdoor Pool, Free WiFi, Business Center, Free Weekday Paper, Bus, Truck, RV Parking, Guest Laundry, Pets Allowed (Fees Apply). Jetted Tub in Some Rooms, Cinema Room, Free Local Calls, Wireless High-Speed Internet Access in Common Areas. Free WiFi, Pets Allowed (Fees Apply), RV, Bus, Truck Parking, Computer Station, Free Breakfast, Picnic Area. Reservations will be available one year prior to the event. Offers Free Nightly Astronomy Seminars, BBQ Grill, Computer, Copier, Internet Services, Satellite/ Cable TV, Washer/ Dryer.